This fall my husband and I went to Jordan. It was an adventurous trip that included a speeding ticket, a flat tire in the desert, a spectacular rescue and, most importantly, dromedaries. Dromedaries were everywhere. Unlike the donkeys who often seemed neglected and abused, dromedaries looked by and large well taken care of. We don’t know for certain because of the large animal’s stoicism. (Though I swear I heard them speaking whole sentences. Seriously, the variety of sounds a dromedary can emit is mind-boggling.) I love the dromedary’s weird way of getting up and down, its comical mouth, and, yes, its camel toes. Feeding cucumbers and apples to two dromedaries was definitely one of the highlights of my trip. The interior of a communal Bedouin goat hair tent. The rugs here are similar to the ones seen on camels. Another highlight was the long, meditative ride on a dromedary through the desert of Wadi Rum (pronounced like the liquor). While on the large animal’s back, I wondered how the saddle is designed to fit the hump. 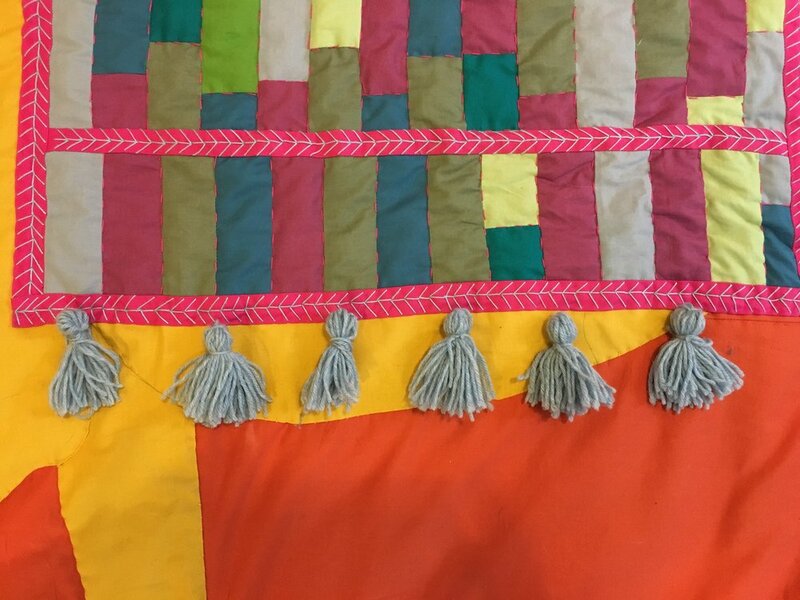 The saddle is a pile of geometrically patterned rugs equipped with colorful tassels, pompoms and tethered strings. It adds to the dromedary’s (or camel’s) regal appearance. Our Bedouin guide told us that camels and dromedaries are generally revered because their milk enhances male fertility. It turns guys into studs. One man in the village, the guide said, had 35 children because he drank so much camel milk! In Wadi Rum, the sand is red. It’s a landscape that’s reminiscent of the American Southwest. There are drawings of animals and humans carved into rocks by the Nabatean tribes who once lived there. 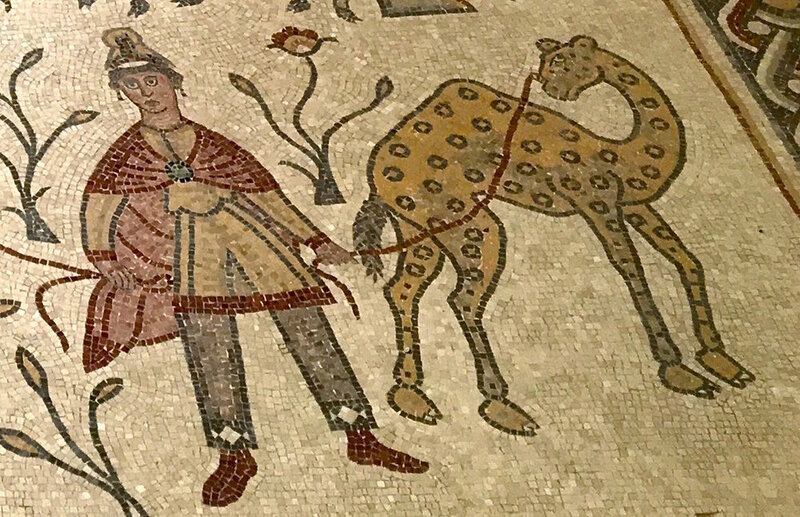 Later, at the archeological museum in Amman, we see a camel carved into red rock; in one of the fine church mosaics of Madaba, a spotted dromedary is led on a leash. How could I say no to a camel quilt?